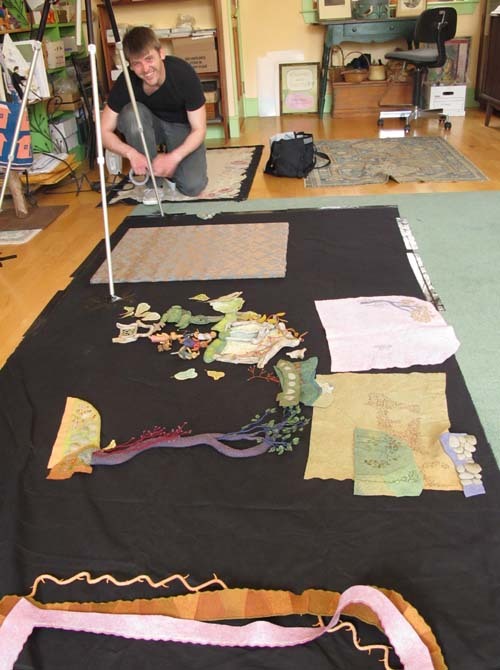 For the past 4 months, I’ve been working on Rabbitat, a large (24″ x 30″) fabric relief piece. It started as a simple driftwood house, then I added a rabbit topiary and over time it grew into a lush rabbit habitat. I’m not showing much yet, just peeks now and then, because I want to show it later, when it’s finished. Here are some detailed shots of some rabbit characters. A team of local filmmakers are gathering material for a short 5 min. film (see film here) about my work and specifically this piece. You can see an earlier post about Rabbitat here. We want to show a time-lapse of Rabbitat being put together, so filmmaker Daniel Cojanu locked the camera and tripod in place with duct tape. He took a series of photos, one for each bush, tree, rabbit, or felt background piece that I added, until it was all put together. Here are some parts laid out and ready to be set in place for the time-lapse photo shoot. Now that we’re finished with that, I can sew everything to the stretched upholstery fabric background and Rabbitat will be complete! 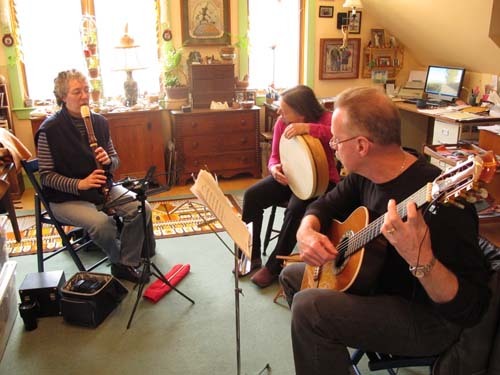 We want music in the film, so I asked local musicians Jan, Tom and Lisa to play some traditional Irish and Scottish tunes. We chose bouncy, rabbit-like music for them to play. I’ve known Jan since childhood and she is incredibly talented on the recorder, pennywhistle and concertina. Elise and Daniel recorded them in my studio and what a treat to hear them play! Making this film has been so much fun and I can’t wait to see what they put together. 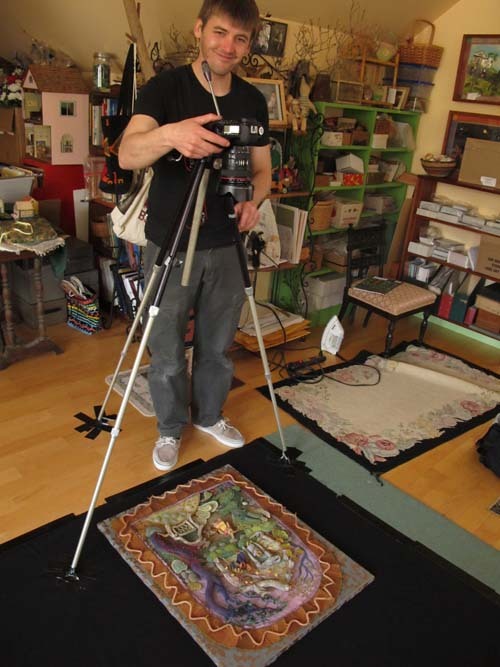 We’re planning on having the film ready to show this summer at the Woods Hole Public Library. They’ve been kind enough to organize a reception to celebrate my Golden Kite Award for Pocketful of Posies on July 10th, from 5 to 7pm. Original illustrations will be displayed during the event and I’ll give a short talk. I hope that some of you can come. I’ll also figure out a way for everyone to see the film online. Stay tuned! 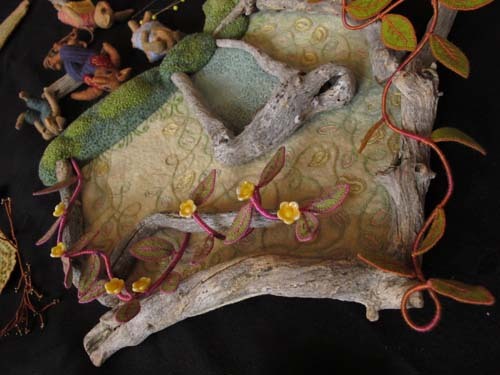 This entry was posted in Animals, Fabric Relief, Felt, Rabbitat, Studio by Salley Mavor. Bookmark the permalink. Salley, all of your work is so lovely, but some of it actually causes my mouth to drop open in awe. The rabbit in the first photo is wonderful! Wow! I can’t begin to describe how much your work just puts me in awe! I know the kind of work it takes to come up with something as beautiful as the work you do. Thank you so much again, Salley, for sharing them! I’m looking forward to the great reveal! Love the “Green man” rabbit. What a fun post! Thank you for sharing all the steps and photos! It will be a wonderful recpetions! Oh, wow, wow, wow!!! I love rabbits and this is going to be another fantastic piece of work!!! Beautiful!!! I’m so glad those of us not on the East coast will have a chance to see this film on line; how fun! Thank-you for your generosity. Oh wowie zowie zinger – the rabbits, especially the first one and the baby in the carriage, are amazing! I am so glad we will be able to see the film and the piece online when the project is done – I think otherwise I would have had to stowaway on a plane bound for somewhere near Woods Hole! Thanks for the teases! Oh, so beautiful! 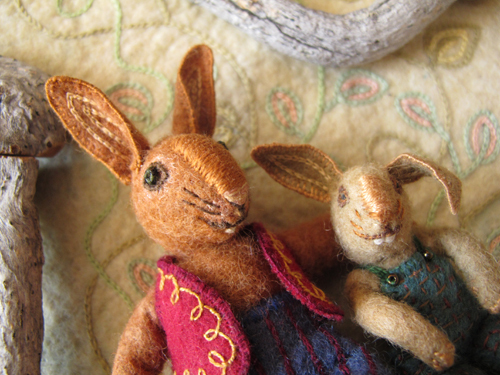 The embroidered rabbit is just stunning. 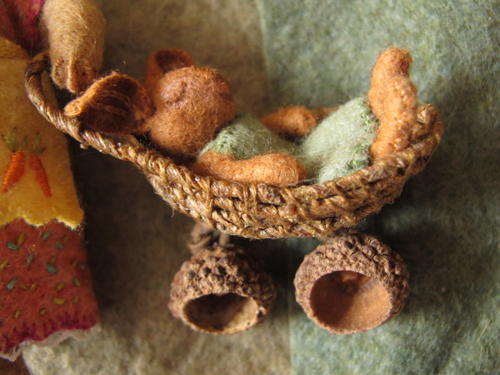 Just how dear is the baby rabbit in the pram? I love the acorn wheels. Did you weave the pram, Salley? What is it made from? Can’t wait to see the completed project! Goodness me Salley what a work of art. The details of the rabbits are stunning. I love the little pram too! I will enjoy watching the film when it is finished. Thanks for sharing your amazing project. 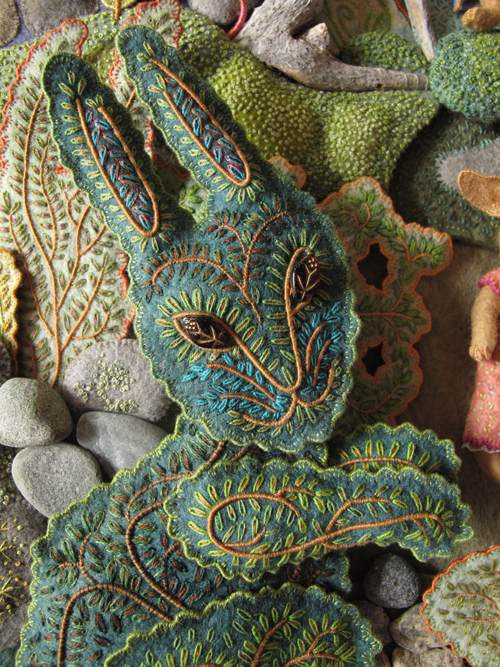 I gasped when I saw the embroidered rabbit – so beautiful! I just love your rabbits and can’t wait to see the finished piece. Is the embroidered rabbit in one of the books? I love that and what a wonderful idea for gifts. Thanks, Debbie. The rabbit is not in any of my books, but there are a cat and bird topiary in Pocketful of Posies. WOW!!! Your work is BEAUTIFUL!!!!!!!! You must have a fasination with Bunnies???? I know I do!!!! 🙂 Can’t wait to see your finished film!!!! What made you decide to do this???? What TIME you have invested!!!! You can see it!!!! JUST GORGEOUS!!!! Congrats on your nursery rhyme book being named as a nominee for the 2011 Texas Bluebonnet award. I’ve been a fan of your work for awhile now and it was great, as both a librarian and artist, to see you being honored. Thanks for letting me know, since I was unaware!